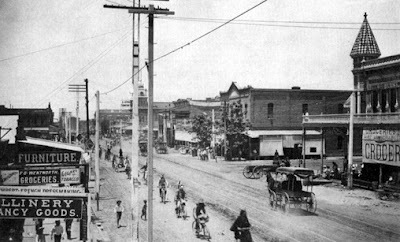 I collect old photos of Phoenix, and share them on the internet, and quite often I see comments about how nice it would be if Phoenix were still a small town. And I will often see comments like "a simpler time". And I agree that small towns can be nice, but as I write this, there are still plenty of small towns that can provide that "simpler time". When I can, I like exploring these small towns with some of my history adventuring friends IRL (In Real Life) and there are plenty of them. And, at the risk of sounding as if I'm poking fun at people who want to see Phoenix "in simpler times", there are plenty of places right nearby that didn't grow all that much in the last 100 years, and you can see them anytime you want. You can even live in them, some people do. If you want to see what Phoenix looked like as a small town, I invite you to visit any small town. Here in Arizona, there are still a lot of places where the "sidewalks are rolled up at sunset", and where you can walk to the only grocery store in town. In my travels I've usually found that no matter how small the town, there are plenty of places to get a drink, as was very true in territorial times in Phoenix. No need to go thirsty! I've never really lived in a small town, and the closest thing I know about life there is from where my grandma lived, in northern Minnesota, where the town was so small (and still is!) that you felt as if you had to change the number on the population sign when you left. It's a place that doesn't require a map to get around, and there's just one main street, which people just refer to as the main street, no matter what it's official name is. As a kid I spent a lot of time in that town, and since the population was about 500 (at the most!) you'd run into the same people over and over again. And as I study old-time Phoenix I see the same thing, families socializing, young people marrying into local families, and making the small town seem even smaller. Of course, if you have a falling out with someone, a small town can feel very small, and you really do have to "deal with it" if you're unhappy about the prices at the only grocery store in town. Small towns, of course, are very gossipy, and it can be difficult to protect your privacy, as most people will recognize your car, and see if it's not parked, uh, where it should be. Presumably people in old-time Phoenix could recognize someone's horse the same way. Or they could see if you were walking over to Melinda's Alley, which was the "Red Light District" going back to the 1890s, and was just a half-block from "Millionaire's Row", where the mansions were, such as the Rosson House. Speaking for myself, I probably would have wandered down Melinda's Alley, and if people gossiped, I wouldn't give it much thought. I've walked down many alleys in my day, and it probably has puzzled people, if they were wondering why I was there, and where I was going. The last time I visited my grandmother, in 1995, I went to church with her, and she introduced me to some people there. A couple of days later, as I was walking around the little town, I stopped in for a cold one at a local tavern, and someone shouted "Brad! ", and of course it was someone from the church congregation who was happy to see me. I had been living in Phoenix at the time, and right before that in Los Angeles, and I gotta admit it seemed weird to walk into a place and hear my name. But that's a small town. And you really don't have to have a time-machine to understand how Phoenix was in territorial times, just visit any small town. Image at the top of this post: Phoenix, Arizona in the 1890s. You're looking west on Washington towards 2nd Street. Looks like there was a bicycle race going on! Let's watch!